A predictable sight at the seven public meetings held to date on the new city sign ordinance has been billboard company lobbyists at the speakers’ podium, all arguing that the proposed ban on digital signs and the limitations on the height and size of billboards and other signs will impede business activity and cost jobs. While they have offered scant evidence to support these predictions, one thing is clear. The process of revising the sign ordinance has provided plenty of employment for lobbying firms that have also raised significant amounts of money for the campaign coffers of city politicians. For example, the four largest billboard companies in the city-Clear Channel Outdoor, CBS Outdoor, Van Wagner, and Lamar Advertising, paid $217,000 to lobbying firms in 2008 and the first quarter of 2009, according to reports filed with the City Ethics Commission. The biggest spender was Van Wagner, a New York City based company that has supergraphic signs in L.A. in addition to conventional billboards. Van Wagner, one of a number of companies that have sued the city to block enforcement of a ban on those supergraphics, paid lobbying firm Cerrell & Associates $90,124 in 2008 and the first quarter of 2009. Other lobbying payments made during that time period were: CBS Outdoor to Afriat Consulting Group, $71,127; Clear Channel Outdoor to Urban Solutions, $36,281; and Lamar Advertising to Ken Spiker & Associates, $20,000. In addition, the California Sign Association, whose membership includes those companies, paid $18,000 to the lobbying firm, Arnie Berghoff & Associates. Those same lobbying firms also helped bankroll 2009 election campaigns through fundraising for candidates for city attorney, city controller, and the city council. According to Ethics Commission reports, a total of $173,900 was raised for candidates, although it should be noted that the above lobbying firms have a variety of clients in addition to the sign companies. The most favored recipient of this largesse was City Councilman Ed Reyes, who was given $26,450 for his re-election campaign against token opposition. Reyes is chairman of the council’s Planning and Land Use Management Committee, which conducted hearings on the new sign ordinance. 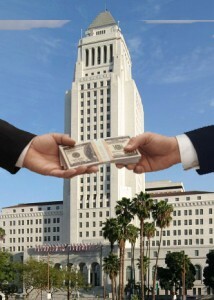 Other major recipients of campaign funds raised by lobbying firms representing sign companies were Councilman and City Attorney candidate Jack Weiss, $23,250; Councilman Dennis Zine, $22,250; City Council President Eric Garcetti, $17,500, Councilmember and City Controller candidate Wendy Greuel, $15,500; Councilmember Jan Perry, $10,000, and Councilmember Janice Hahn, $8,250. Of that group, only Weiss and Greuel had more than token opposition in their campaigns. 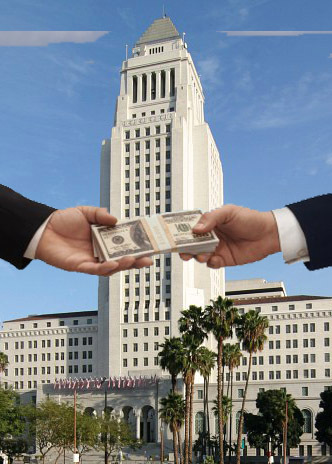 One of the lobbying firms, Urban Solutions, also reported delivering the maximum $500 campaign contributions from Clear Channel Outdoor to Councilmembers Hahn, Zine, and Garcetti. The contribution to Garcetti was made more than a month after he said in a radio interview that he had never “willingly” taken campaign contributions from billboard companies. Lobbying firms haven’t been the only organizations speaking against the new sign ordinance while helping fund city election campaigns. Representatives of the International Brotherhood of Electrical Workers (IBEW) have raised the spectre of the proposed digital sign ban throwing electricians out of work. At the same time, according to Ethics Commission reports, the union made independent expenditures totalling a whopping $137,000 for Wendy Greuel’s campaign for City Controller, and another $19,000 for City Council candidate Paul Koretz.